He didn't have a clue his Double Fine Adventure would be this huge fundraising drive. When I woke up this morning, I was happy to eat my cereal and feed my kid her oatmeal. When Tim Schafer woke up last Wednesday morning, he had already earned $800,000 for a game he hadn't even made yet. 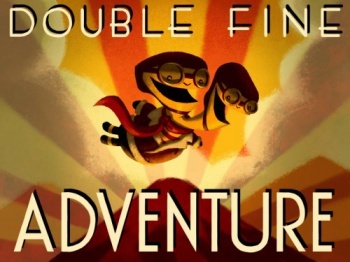 Not many people could have anticipated the huge success of Double Fine's Kickstarter fundraising, least of all Tim Schafer, as the current total sits northwards of 1.7 million dollars donated by nearly 50,000 people with 29 days left to go. Schafer promised he would give the backers what they want: an awesome adventure game and a no-holds-barred look at the making of that game with him as the MC of the documentary circus. Schafer admitted that he hasn't really solidified what the game will be about. "I have some vague ideas floating around in my head," he said. "But importantly, this isn't just making a game, but making a viable documentary about it. People often ask where ideas come from and how they turn into games, and this is a great way to show the entire process from lose ideas to a developed concept. We're going to put it all on camera. It'll be like The Office, with me as Ricky Gervais." Is he worried about all the pressure of 50,000 backers demanding he adds so-and-so to the game, because hey, they are the backers. "Double Fine is still going to be responsible for the game," he said. "We can't say, 'We made a crummy game, but the fans made us do it.' We're going to make sure they get a game they like - and that doesn't always mean doing something they've asked you to do. If you're making a shooter and the fans say, 'We want the shotgun to be more powerful', you might not be able to do that because it's tied in to a lot of other systems. "The fans will get a really original adventure game," Schafer said. "That's what they want." Did he think he'd make quadruple his asking price before a week was through? "No, I guessed by the end of the first night we'd be at $2000," he said. "People were saying it's crazy to ask for $400,000 on Kickstarter, but I was just working off what I knew it would actually cost to make a game. It's shocking that games cost millions of dollars to make. But you've got to pay salaries. People are expensive ..."
To be fair to the all of the commentary from last week about Schafer blowing up the publishing model, he doesn't want to portray corporations as evil. "I'm not trying to vilify them," he says. "Publishers do their business in a way that works for them. They're risking millions of dollars so they've got to mitigate that risk - and sometimes that means removing risky ideas from games. The thing is, Double Fine is all about coming up with new, unproven and really creative ideas. It's a constant battle for us to get those ideas to go through the system, that long spanking machine of people who have to sign off on you. They're not evil, they're just trying to protect themselves." Even the previously fertile ground for independent games like such as Xbox Live or the Sony Entertainment Network still cost too much money. "Those systems, as great as they are, they're still closed," he said. "You have to jump through a lot of hoops, even for important stuff like patching and supporting your game. Those are things we really want to do, but we can't do it on these systems. I mean, it costs $40,000 to put up a patch - we can't afford that! Open systems like Steam, that allow us to set our own prices, that's where it's at, and doing it completely alone like Minecraft. That's where people are going." And now that Schafer has paved the way, will we see shift to independent companies Kickstarting games for open platforms? I sure hope so.